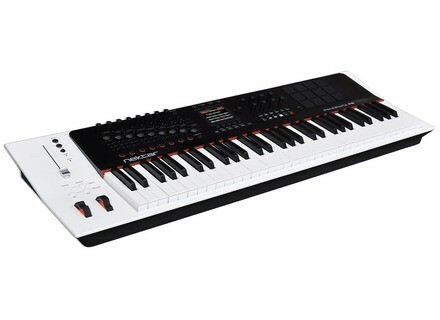 Panorama P6, 61-Key MIDI Keyboard from Nektar. This new v1.5 update features a completely revised mapping engine for the Cubase 5-8 and Nuendo 4 and later plug-ins that allows for dynamic management of updated plug-ins (patch change, parameter mapping, parameter name update…). A Learn feature also allows for creating custom mappings for each plug-in patch and save them for automatic recall later. If you own plug-ins that are not supporter by the Nektar mapping system, the brand offers four “user” pages to map the 8 encoders and 4 screen buttons available on the keyboards as well as a a dedicated fader page, for a total of 73 configurable controls for each VST instrument and 48 for the insert plug-ins. The update also adds several fixes and improvements, including the track select tracking for the motorized fader and Solo/ Mute buttons, track name display under the virtual faders in Mixer mode for the selected bank, updated macro names for Absynth and Massive and reduced latency when changing track with Vienna Ensemble Pro 5 VST 3. The update is available for free download from www.nektartech.com. [Musikmesse][VIDEO] Softube Heartbeat Before we can finally put our mouse on the new Softube virtual drum synth, here’s a demo of this new Heartbeat shot today by our team at Musikmesse. [Musikmesse] PreSonus Studio 192 PreSonus introduces at Musikmesse the Studio 192, its very first USB 3.0 audio interface equipped with XMAX mic preamps.